Most people who are interested in Toyota’s management practice have no interest in the history of progressive management ideas and practices that preceded it. Nor is there much interest in the problems and difficulties faced by those who worked to advance progressive management prior to TPS. I find the lack of curiosity to be unfortunate. The vast majority of people think that what they see today represents the good stuff, and all the bad stuff was filtered out in the decades prior. Surely smart people in years gone by would not carry forward bad ways of thinking and doing things, right? Wrong. If we do not understand this as fact, then we cannot move past the many bad ways of thinking and doing things remain with us today. History helps make this clear and imbues us with wisdom to avoid repeating mistakes that harm people and which consume precious resources such as time, material, and money. What immediately preceded the creation of Toyota’s production system? What were the assumptions and business needs that led to the creation of progressive management practice? How did the creators of progressive management put their new ideas into practice? What kinds of problems did they face in advancing the new management practice? How influential were early progressive management ideas and practices in the creation of TPS? Why do business leaders struggle so much to understand progressive management? What effective countermeasures can be applied to overcome leaders’ resistance to progressive management? How can progressive management be so popular with some people, yet simultaneously so unpopular with other people? Why do such divergent views exist and persist? Answering these questions about the past, as well as surrounding factors such as economics, politics, and social hierarchies, helps us better understand the current condition and future state of the popular version of Toyota’s management practice known as Lean. Will Lean continue to thrive? Will it maintain its current level of popularity? Will Lean die quickly or fade away slowly? What factors contribute to its continuation, growth, or demise? These are the kinds of questions that have long interested me. Don’t erase the past. Learn from it. Another question that interests me is why the creators of Lean have been so disinterested in gaining an accurate understanding of the history of progressive management between the years 1880 to 1935. It is a heritage that they work very hard to disassociate Lean from, as if it were a plague. I have said previously that the better approach is to confront the past and teach people how it informed the development of TPS and its linkage to the derivative work called “Lean.” Doing so might have improved how Lean was seen by people and resulted in broader acceptance – especially among workers. Instead, the intelligent and thoughtful work of the truly innovative management pioneers who came before us has been ignored or misinterpreted. It is remarkable that the good people who brought us Lean, James P. Womack and Daniel T. Jones, could so easily fall prey to, and perpetuate, the common view that those who created the antecedent to TPS were villains, rather than seek the facts to understand the important work done a century ago, its evolution, and how it continues to be part of Toyota’s management practice today. I expected better. Thankfully, it is not too late for you to learn from history. Below is a curated collection of blog posts that explore many of these questions. I’m sure that if you read them, you will discover that history matters. The posts below are listed in reverse chronological order (oldest first). 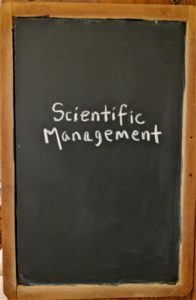 I have read and re-read “The Principles of Scientific Management” along with the transcripts of the court proceedings against Taylor. I credit you with allowing me to see beyond all of the negative press when I revisit his writings. I have to stop myself and say “Stop, read this as though the writer was actually in the camp of the worker and not against him” and then I can at least envision thoughts that are not abusive to the worker but rather seek to maximize the gain to both the employees and the company. Of course even the best of philosophies can be spun by the unscrupulous to their own ends and I feel sympathy for Taylor because even at the end I am not sure he understood the forces that were against him or why they took offense. Hi Vaughn – “…and I feel sympathy for Taylor because even at the end I am not sure he understood the forces that were against him or why they took offense.” That is a wonderful insight. I believe that looking to the history/ past is a very important tool. Many issues in the past still seem to happen today, in other sorts. History is ever occurring and looking to the pasts solutions can shine line on solutions we face to this day.